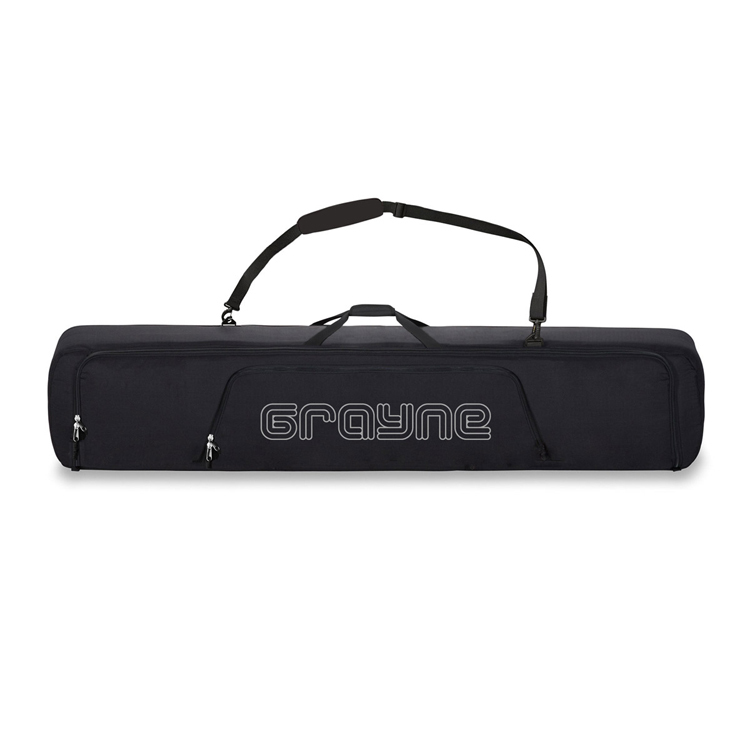 The Grayne Pro Deluxe bag is redefining board protection. A sturdy, high density foam is packed in to each of the walls and in to the bottom of the bag to provide maximum care for your gear. The exterior of the Pro bag is made of a heavy duty, double stitched ballistic nylon, leaving it practically bombproof. Inside the Pro Deluxe bag you will find a large compartment with tons of storage room. With sizing that will fit multiple boards up to 170 cm, you’ll still have plenty of room for a pair of boots, a set of bindings, and maybe even your jacket and pants! Two reenforced retention straps keep everything firmly in place once packed as well! For even more storage the Pro bag features two additional accessory pockets. The front pocket is a large compartment great for gloves, goggles, tools, or even snacks! The rear pocket is again a large pocket with interior restraining straps to tie down any gear you still have left over, or as a holding pocket for the shoulder strap when not in use. The shoulder strap is great for long carries or transporting through the airport, and when not in use is easily unclipped and stored in one of the 3 pockets for a clean streamline look. A padded velcro handle makes for added carrying options and quick transport. The Pro Deluxe bag is simply the perfect bag for everything from air travel to protecting all your gear when in storage.